"Instead of the bloodthirsty and ferocious nature appropriate to his feline ancestry, Felifax inherited the loyalty of his father, Brahman Rao, and the beauty his mother, a descendant of Tamerlane." A tall and supremely handsome man--a demigod, rather--was walking through the crowd. One strange detail: his back was marked with light brown stripes, somewhat reminiscent of those on a tiger's skin. The strange individual drew two regal tigers in the prime of their savage beauty along, holding them by the scruff of the neck, and the terrible carnivores made not the slightest attempt to flee. This terrifying apparition, in the bloody glare of the fires of Bengal, was accompanied by these whispers: "Rudra, the man-eater!" "Durgane, the crusher!" "It's him! The son of Kali!" 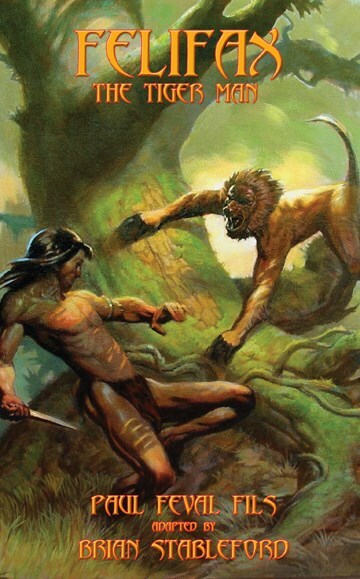 In Felifax, originally published in 1929, Paul Féval fils, the son of Paul Féval, took on the perhaps impossible task of trying to bring two archetypes together, Sir Eric Palmer, the great British detective, successor of Sherlock Holmes, against jungle-born Felifax, the tiger-man, a clone of Tarzan, in the hope of generating a singular literary synergy. Unlike the vast majority of Tarzan imitations, Felifax is not a feral child but the result of a biological experiment. This element of the plot is particularly interesting, because it forges a thematic link with the comic-book superheroes. Felifax is brand new as a significant anticipation of the Incredible Hulk.